More than 20 employers are expected at the Seguin Chamber’s Job Fair next month. Seguin’s largest employers will be hiring for entry, intermediate and advanced-level positions. Participating companies include Continental Automotive Systems, Cavco, Guadalupe Regional Medical Center, Alamo Group (TX), GVEC, Griffith Ford, Hawkins Personnel, CMC Steel Texas, Priority Personnel, Navarro Independent School District, AA Care Services, and more. 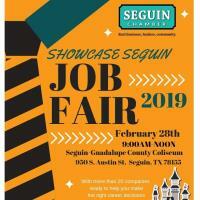 The Job Fair will be held Thursday, Feb. 28, from 9 a.m. to Noon at the Seguin Coliseum, 950 S. Austin St. Applicants should dress formally and bring resumes. A Dress for Success seminar will be held Monday, Feb. 25, and will include a Job Essentials Kit and gently-used professional clothing for potential employees. The Seminar will be at the Aumont, 301 N. Austin St., from 5 to 7 p.m.